Bio Notes: Donald Alexander Stewart was born on 6 July 1876, the son of Alexander Stewart, hotel keeper, and his wife Christina McPherson. He educated at Sharp's Institution, Perth, and articled to David Smart in Perth from 1 August 1892, Smart then working in partnership with his son James as D & J Smart. Stewart completed his apprenticeship with David Smart after the dissolution of the partnership with his son in 1895, which was probably due to a family agreement regarding the readmission of James's own son John to the practice. Stewart became David's senior assistant the following year, and on 1 January 1907 was taken into partnership, the firm name becoming Smart & Stewart. Prior to this Stewart had travelled abroad three times, each time spending a week in France and Belgium, and he had served as secretary of the Perth Architectural Association in the late 1890s. Later he was President of the RIAS. Smart retired in or about 1911 at the age of 86 and died in 13 October 1914 at the age of ninety. He was then living at Rockbank, Kinnoull, and left a widow, Margaret Morrison. He left a moveable estate of £8589 13s 4d, comparable with the most successful Glasgow practitioners, suggesting a large domestic practice or perhaps inheritance. Stewart continued the practice alone under the same name. In early 1911 he was admitted LRIBA, his proposers being George Penrose Kennedy Young and William Fleming Wilkie. In 1919 he employed Robert Matthew Mitchell as an assistant, taking him into partnership five years later, the firm name becoming Smart Stewart & Mitchell. Mitchell was slightly older, born in 1874 and had been apprenticed in a 'workshop' (presumably a joiner's). He was essentially self-taught, having gained a place in the office of James Graham Fairley in Edinburgh in 1896 without any formal apprenticeship. In 1898 he had moved to the Stirling firm of McLuckie and Walker and in 1901 had commenced practice at 27 King Street, Crieff. Owing to lack of business he had emigrated to Edmonton, Alberta, in 1911, securing admission as LRIBA on 20 July just prior to his departure. Whilst in Edmonton he had been employed first by Roland Walter Lines and then as chief draughtsman and subsequently chief architect to the Edmonton Public School Board. He had returned to Scotland on war service in 1916 and had chosen to remain. 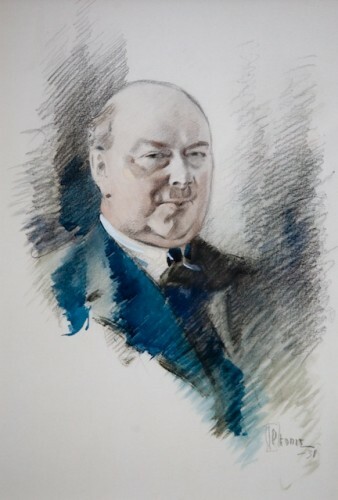 Stewart was elected FRIBA in November 1929, proposed by the RIBA Council, of which he was a member; he had also served as President of the Dundee Institute of Architects. He died on 16 January 1940. He had been married twice, first to Georgina McDougall, and second to May Isobel Elliot. After 1919 Campbell's Dyeworks Perth Perthshire Scotland Extension?